The brilliant new Wilde/Chase novel from bestseller Andy McDermott - in their eleventh adventure Nina and Eddie must go on a desperate search to find the truth behind the Book of Revelation, as they try to deal with the most momentous change to their lives to date - Nina's pregnancy... For fans of Cussler, Mariani and Rollins, the Daily Express says McDermott's novels 'explode off the page'. 2002 - Southern Iraq A CIA covert operation in the desert uncovers ancient ruins concealing a humanoid statue, with six wings and the face of a lion. Team member Ezekiel Cross is convinced that it represents one of four angels prophesied in the Book of Revelation, and when the agents are attacked by Iraqi forces, leaving Cross the only survivor, he steals it to begin his own mission from God ... Present Day - New York Depressed following the death of a friend, Nina Wilde has been focusing her energies on her pregnancy, rather than the archaeological discoveries for which she is renowned. But adventure still finds her - when she's kidnapped by religious cultists intending to force her to locate the remaining angels! Held prisoner in a strange village, Nina engages in a battle of wits against her captors, knowing her only hope of rescue is for her husband Eddie Chase to find the other statues first. But with a ruthless maniac determined to fulfil Revelation's prophecy, time is running out. Only by keeping the angels out of the cultists' hands can Nina and Eddie prevent the coming apocalypse ... but what price will they have to pay? Andy McDermott is the bestselling author of the Nina Wilde &amp; Eddie Chase adventure thrillers, which have been sold in over 30 countries and 20 languages. His debut novel, THE HUNT FOR ATLANTIS, was his first of several New York Times bestsellers. 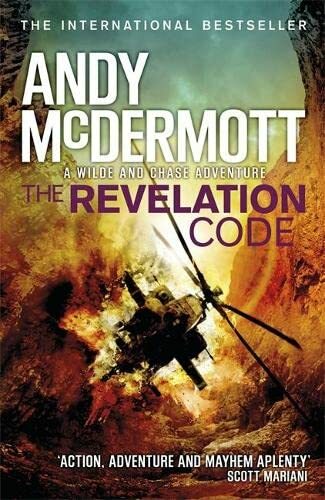 THE REVELATION CODE is the eleventh book in the series, and he has also written the explosive spy thriller The Persona Protocol. A former journalist and movie critic, Andy is now a full-time novelist. Born in Halifax, he lives in Bournemouth with his partner and son.